Own your pores like a Bioré Princess! Dubai, UAE, November 28, 2018: The style and elegance of the famous Princesses of our time are often admired, and when it comes to their flawless complexions, it’s hard not to also want to achieve the same unblemished and immaculate skin for ourselves! Tip 1: Clean! Clean! Clean! Skin types may differ, but every skin requires staying clean! Make sure you cleanse in the morning and before you go to sleep to unclog your pores from dirt and impurities. To avoid layering on top of clogged pores, cleanse your skin right before applying your make-up, so that you have a fresh, clean canvas to work with. Our secret weapon is: Bioré® Deep Pore Charcoal Cleanser. Infused with Japanese Skin Purifying Technology, this cleanser draws out and traps 2x more dirt and impurities than a basic cleanser. Pores are twice as clean after just one use! Our hottest innovation is: Bioré® Baking Soda Pore Cleanser - This every day liquid cleanser deep cleans to remove dirt and impurities from the pore while gently exfoliating away dead cells to reveal smooth, healthy-looking skin! Tip 2: Go the extra mile! While keeping your face clean is high on the priority list, Bioré has a range of products that will go beyond just cleansing your pores. Make sure you give your skin some royal tender loving care once or twice a week, whether it’s with some mask fun or a more exfoliating face scrub for a deeper skin clean! 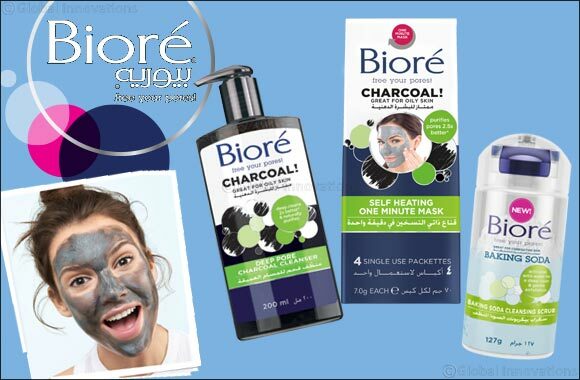 Bioré® Charcoal Self Heating One Minute Mask is our must-have mask. Infused with natural charcoal, this thermal mask heats on contact with water to open pores and draw out pore-clogging dirt and oil, then cools leaving skin tingly smooth and purified pores in just 1 minute! Bioré® Baking Soda Scrub is our newest much loved easy-to-use, powder-to-foam formula. This concentrated powder scrub gently cleanses pores 2.5x better versus a basic cleanser, while exfoliating without overscrubbing. You’ll see an instantly smoother, softer texture and visibly tighter pores after just one use! Bioré® Ultra Deep Cleansing Pore Strips: This maximum power pore strip removes pore-clogging dirt, oil and blackheads for the deepest clean! Bioré’s Baking Soda and Charcoal collections are available in major hyper and supermarkets, including Carrefour, Lulu and Spinneys. Feel beautiful in your royally purified skin and don’t forget to smile! In 1980, Kao, one of world’s leading manufacturers of cosmetic products, launched a new face care brand in Japan: Bioré – a word creation made from the Greek expressions “Bio” = life and “Ore” = precious. Today, Bioré, the #1 facial cleansing brand in Japan, has been established as a global mega brand within the face care sector and is still often ahead of its time with its innovative products and ingredients.